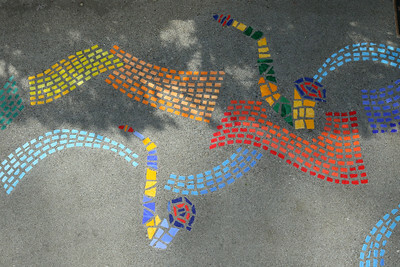 Mosaic honoring the legacy of multiphonic saxophonist Bert Wilson. 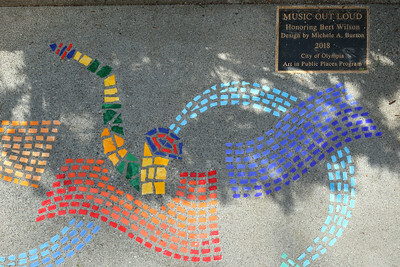 Part of the City of Olympia's Music Out Loud program, which spotlights the contributions of outstanding musicians who lived and worked in Olympia. Designed by Michele Burton. Fabricated by Belarde Company, 2018. 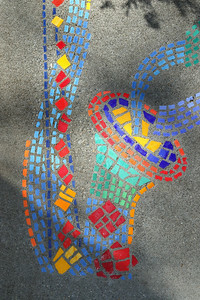 Detail of the mosaic honoring the legacy of multiphonic saxophonist Bert Wilson. Part of the City of Olympia's Music Out Loud program, which spotlights the contributions of outstanding musicians who lived and worked in Olympia. 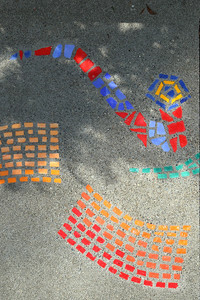 Designed by Michele Burton. Fabricated by Belarde Company, 2018.